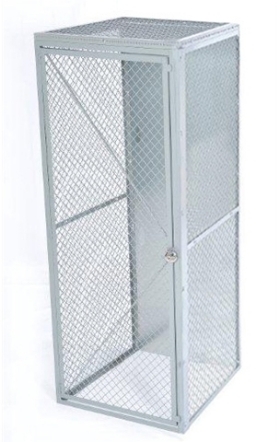 Wire mesh and welded wire Military Personnel Storage and Tactical Readiness Lockers from provide instant, versatile, and safe storage for individual's equipment and belongings while providing ventilation and lighting for the contents. These storage lockers are not just exclusive to military or law enforcement use, they are great security control products for personnel storage within offices and warehouses. Modify the layout and sizes as necessary. 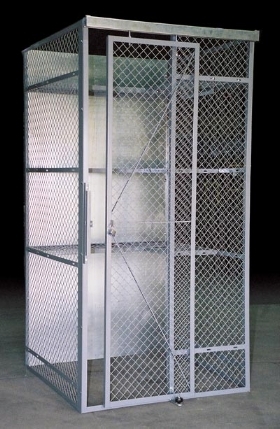 Our storage lockers are also available in a high-security 6-gauge welded wire unmatched in the industry. 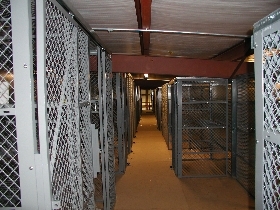 A welded wire shelving system is included with your storage lockers. Other options are available such as interior garment hangers. 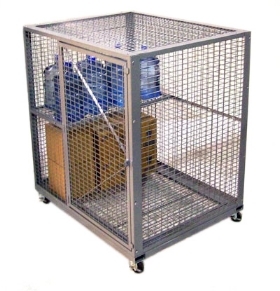 Portable Storage Lockers with casters have many uses for moving valuable product that has physical security requirements. 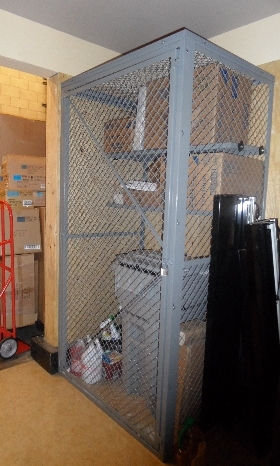 Options include internal shelves, fork pockets, pull bars, and a variety of door arrangements. Our Portable Storage Lockers can be shipped as kits allowing for tighter package of large orders cutting down on shipping costs or can be shipped pre-assembled depending on your needs. Panels are constructed of standard 10-gauge, welded 2" x 2" square mesh. 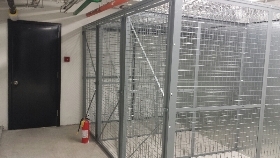 Mesh is securely welded to frames made of 1 1/4" x 1 1/4" x 1/8" structural steel, with all joints mig welded. Doors are constructed of the same materials as the panels. Hinged door sections are pre-hung with three 2 1/2" x 2 1/2" steel hinges. Sliding doors are equipped with 2-wheel trolleys, enclosed track, and door guide. Padlock latches are provided with every door section. Shelves are made from 6-gauge welded wire mesh, securely welded to 1 1/4" x 1 1/4" x 1/8" structural steel frames. Shelves span wall-to-wall, and are connect to/through the wall panels. (Optional) Backs are made from 20-gauge sheet metal and, (Optional) Tops are made from the same material as the panels and doors.